The right of public access to information held by government bodies empowers individuals and communities to be able to engage and participate in decisions that affect their fundamental human, social and economic rights relating to sustainable development. While it has been recognized since the Rio Declaration as important, it is crucial to include it as a key element in the Post-2015 agenda. The importance for ensuring access to information was first recognized in Principle 10 of the Rio Declaration, which stated, Environmental issues are best handled with participation of all concerned citizens, at the relevant level. At the national level, each individual shall have appropriate access to information concerning the environment that is held by public authorities, including information on hazardous materials and activities in their communities, and the opportunity to participate in decision-making processes. States shall facilitate and encourage public awareness and participation by making information widely available. This was further elaborated in Article 25 of the Millennium Declaration and Articles 42, 43, and 44 of the Rio+20 The future we want Declaration. The right of access to information has been adopted into law in over 100 countries around the world from the largest countries (China, India, USA, Indonesia, Brazil, Nigeria and Mexico) to some of the smallest (Cook Islands, St Vincent and the Grenadines) covering over 80 percent of the world’s population. Many countries, including South Africa, Mexico, Fiji, and Cape Verde have also incorporated it into their national constitutions. Typically, the laws give any person the right to demand information from public bodies, subject to limited exemptions. Public bodies must respond to the requests within a limited time frame and publish information on their web sites and though different forms of media. An appeals and oversight mechanism are also typically provided for. Minimum standards on the laws have been adopted by the UN Human Rights Committee, African Union, Council of Europe, and the Organization of American States. In international human rights law, the right of information is recognized by the UN Human Rights Committee in General Comment 34 on free expression, General Comments 14 (health) and 15 (water) of the Committee on Economic and Social Rights and General Comment 4 of the Committee on the Rights of the Child on Adolescent health and development, and regional human rights bodies, as a key element of the right of free expression. In addition, numerous special rapporteurs of the Human Rights Council, have found that it is essential for promoting sustainable development generally, including fighting poverty, ensuring access to water and sanitation, promoting a healthy environment, and ensuring the rights of health and education. 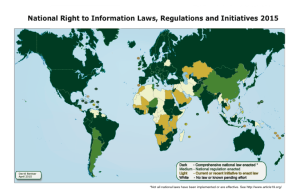 Further regional human rights conventions in Asia, Europe, the Americas and Africa all require governments to make available information available to the public (1). The UNECE Convention on Access to Information, Public Participation, and Access to Justice in Environmental Matters (The Aarhus Convention), which implements Rio Principle 10, has been adopted by 47 countries from Iceland to Kazakhstan. A similar instrument is currently being negotiated for the Latin America and the Caribbean region. These rights to information have been extensively used by people to achieve their social and economic, as well as their human rights. For example, in India, the Right to Information (RTI) Act is frequently used by individuals to ensure their rights to food and employment; communities in rural Brazil are using the Access to Information Law to help them fight for better access to, and a better quality of, water; In Indonesia, parents of poor and marginalized school children used the country’s Freedom of Information Law to hold schools to account for how they used school funds; in Senegal, access to information is used to promote better maternal health. A key impact of the right to information is that individuals and communities are better able to participate in decisions when they have information about the activities and policies of the government. Disadvantaged communities often are not able to engage due to problems with access to the information, literacy, and other problems. RTI can reduce these disparities. An example of this is laws requiring Environmental or Social Impact Assessments before major projects are conducted, which have been adopted in over 120 countries. These require that communities are informed about major projects and given facts prior to decisions on the going forward with the projects. This is especially important for projects, which affect indigenous communities. International law required that communities must provide free, prior, and informed consent (2). As the Expert Mechanism on the Rights of Indigenous People stated in 2010, Information is necessary to ensure that indigenous peoples participate in decision-making in an informed way (3). Access to information is considered a key tool in anti-corruption measures as reasons for awarding contracts and other financial transactions must be documented and justified (4). The UN Convention Against Corruption (UNCAC) includes several substantive provisions, which promote public access as a means of enhancing anti-corruption measures and promoting partnerships to fight corruption. Similar provisions also exist in the regional anti-corruption conventions. Access is crucial in many areas of poverty reduction, for example, to ensure that Cash Transfer Programs actually help the people needed, that social programs allow beneficiaries to understand the eligibility criteria so they can receive their proper assistance; so that communities monitor the medicines available in their hospitals, and to allow parents to know about the resources available at their children’s schools and if the teachers are showing up. In Uganda, a government program to publish information about monthly grants to schools combined with other reforms led to substantial reduction in corruption and more money going to classrooms (Hubbard, 2007). Many questions have been raised about the reliability of data collected for the Millennium Development Goals (MDGs). As UN Department of Economic and Social Affairs (ECOSOC) noted as far back as 2003, some countries manipulate statistics, by either increasing or, more commonly, decreasing, the numbers of the poor for political, economic or other reasons which have very little to do with combating poverty (6). The adoption of the right to information legislation has been found to improve record keeping practices of public bodies. This is both due to revised record keeping system to meet the new legal requirements of access but also as noted above to ensure that decisions would appear to be based on rational processes. Some governments have used it as an opportunity to rewrite manuals and other documents. Others keep more information on the decisions. However, its done, statistics that must be backed with information are both more reliable and trusted than those that appear from closed processes. The importance of the right to information is not just limited to national bodies. International bodies including the UN, regional bodies, and international financial institutions should also be more open and make information more available for the same reasons stated above. Only a few UN bodies including UNDP, UNEP, and UNICEF have specific policies, while most International Financial Institutions (IFIs) have adopted comprehensive but limited polices. These were recently highlighted by the UN Special Rapporteur for Freedom of Peaceful Assembly and Association, who recommended all multi-lateral organizations adopted comprehensive policies (7). (1) UN Human Rights Committee, General Comment No 34; Inter-American Court of Human Rights, Claude Reyes et al v Chile (2006); Article 9(1), African Charter on Human and Peoples Rights; African Commission for Human and People’s Rights, Declaration of Principles on Freedom of Expression in Africa; Council of Europe Convention on Access to Official Documents (2009); European Court of Human Rights, Ta¡rsasag a Szabadsagjogokert v. Hungary, (Application No 37374/05), 14 April 2009. (2) African Commission for Human and People’s Rights, 276 / 2003 Centre for Minority Rights Development (Kenya) and Minority Rights Group International on behalf of Endorois Welfare Council v Kenya; Inter-American Court of Human Rights, Case of the Saramaka People v. Suriname, Judgment of November 28, 2007. (4) See Transparency International, Global Corruption Report 2003. (5) Paul Hubbard, Putting the Power of Transparency in Context: Information Role in Reducing Corruption in Uganda’s Education Sector, Center for Global Development, Working Paper Number 136 December 2007. (7) Report of the Special Rapporteur on the rights to freedom of peaceful assembly and of association, (A/69/365), 1 September 2014. David Banisar is a Senior Legal Counsel at ARTICLE 19. He has worked in the field of information policy for over 20 years and was previously Director of the Freedom of Information Project at Privacy International. He has authored books, studies, and articles on freedom of information, freedom of expression, media policy, whistleblowing, communications security and privacy. He has also served as an advisor and consultant to numerous organizations, including the Council of Europe, the Organisation for Security and Co-operation in Europe, the UN Development Programme, and the Open Society Institute. Banisar was a research fellow at the Kennedy School of Government at Harvard University and Policy Director of the Electronic Privacy Information Center in Washington, DC. He has a Juris Doctor in law and public policy from The Columbus School of Law, at The Catholic University of America in Washington, DC.